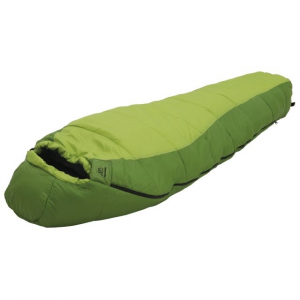 A very warm and comfortable sleeping bag. While the Echo Lake -20 does the job, there are some things that could have been done better. 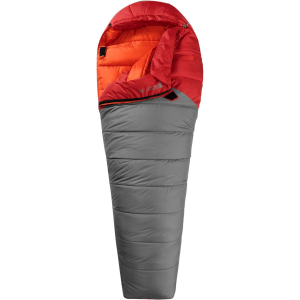 I bought the ALPS Mountaineering Echo Lake -20 sleeping bag in October for dead-of-winter camping. Unfortunately we've had a very mild winter so far, and it wasn't until this past week that we've seen subzero temps. There's no sense in testing equipment if you're not going to approach or push the envelope, right? This past Monday and Wednesday nights were forecast to have temps well below 0, so Monday afternoon I set up my tent, let my Therm-a-rest Trail Pro self-inflate indoors, and took the plunge that night. Sleeping attire for both nights consisted of merino wool baselayer and socks, and a lightweight hood on my head. Monday night the temps didn't drop as low as had been forecast, bottoming out at maybe a couple degrees below 0. Even with my head outside the bag, I was very nearly uncomfortably warm! I have to say that I don't recall ever being so warm while sleeping outside in those temps. The wind was really howling that night so I found myself waking up and adjusting the zipper for comfort when the tent was shaken. Tuesday was "warm" so I slept inside. Wednesday was forecast to be even colder, so back out to the tent I went. Temps WERE much colder that night, getting down to about -12, and I was still warm all night. My head was not outside the bag while I slept, though! The bag fits well, it's just a little snug in the shoulders and chest but I got the long and not the wide. The zipper wasn't straining, and air space is just something your body has to warm up. There's plenty of room below the waist and in the footbox for warming up a layer or 2 for the next day. 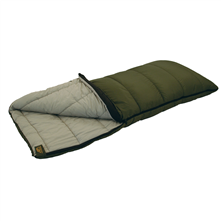 The main deficiency I see with this sleeping bag is the lack of a draft collar. I was getting drafts inside the bag both nights, I was able to eliminate them Monday night by cinching the face opening closer around my neck while sleeping with my head outside the sleeping bag. On Wednesday night, though, my head got too cold while trying that so I ended up closing the opening so just my face was exposed, but this resulted in a lot of frost around the face opening. it also made it harder for me to roll onto my side inside the bag because the opening didn't move with me. The zipper does snag if you don't use your other hand to keep the zipper halves close together while zipping it up. A zipper backing would alleviate this. All in all, I like the bag and recommend it. For the price and performance it's a great deal, and I found its comfort rating to be pretty accurate. It's missing features from high-end bags, like glow-in-the-dark zipper pulls, interior storage pouches, and individual adjustments for openings, but it's completely serviceable and you'll have money left over for more gear. Thanks for testing this, Phil. You are a braver man than I am! It was very cold in Maine last week! Thanks for sharing your experience, Phil. I hope you'll keep us posted on how the bag continues to work out for you. The ALPS Mountaineering Echo Lake -20 is not available from the stores we monitor.